Home|Articles|How to Secure the Labeling of Product Using Labeling Equipment? How to Secure the Labeling of Product Using Labeling Equipment? Ever saw a product without label? If yes, one would not consider it genuine and may not purchase. If No, this can make one understand significance of labeling a product. The display of information on the product, packaging or container is known as Labeling of product. A label details brand name, date markings, and list of ingredients. Labeling provides a unique identity to a product which is crucial to promote it. A customer examines the product prior purchasing with the help of label and details. Attractive label entices the customer. The picky customers read information on label to get details about the ingredients used in the production, by which they can make purchase according to their needs. The ingredients that may cause allergic reaction to the customer can be avoided and those who tend to choose healthy lifestyle can count the amount of calories by the information provided on labels. It is used to provide protection against tampering, to ensure that the product reaches the customer without any interference and unopened. Why Need of Securing Labels arose? Every enterprise strives to supply the products with authentic and authorized logos and labels in the market. But as counterfeiting is increasing day by day, it becomes difficult for them to protect the authenticity. The counterfeiters have become so good at their illegal work that spotting difference between the legitimate and counterfeit products can be challenging. Thus, using the latest technology for making anti-counterfeit labels becomes a necessity. Shrink Sleeve Applicator is used to apply shrink sleeve label on the products. The shrink sleeve label is used in various industries like food & beverages, cosmetics and medical equipments. It is fully automated and customized. The speed of operation can be changed and the model can be modified according to package’s shape. Tamper-evident labels / shrink sleeves can go over a bottle’s cap to create a secure seal. It gives flexibility as the Electro- Pneumatic Control System allows adjusting the multiple container sizes in less time. It eliminates the wastage due to No bottle-No sleeve system of operation. Holagrams labeling machine is used in designing security labels (Overt/Covert) in such a way that it protects from counterfeiting and refilling. Hologram tapes and strips available which can enable security seal on the containers. The machine can bear the company’s logo that validates the originality of the product in the market. It is used in industries like electronics, heath care, food and beverages, etc. It can keep the products safe and secure from unauthorized interference as it possesses a seal. It is user friendly as promotes label placement adjustment, robust and easy to maintain. It creates products labels that are excellent, eye-catching and clear. It is cost effective as it reduces wastage and energy. It applies Hologram tapes and strips on the product easily and quickly. It is a versatile machine as it can complete several tasks such as: product, roll winding and label dispensing. Vial Sticker Labeling machine is utilized for labeling round containers which are previously filled and sealed. This type of label is used in pharmaceuticals companies. It senses the device that ensures smooth operation of the equipment. Inbuilt Automated Label Length detection system reduces human interference. It is suitable for delicate vials and small sized bottles. It is used as security label applicator, hence saves time. Why Shree Bhagwati Labelling Technologies? 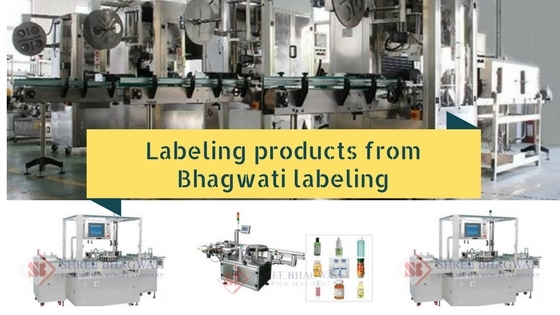 Shree Bhagwati Labelling Technologies is one of the prime manufacturer and exporter of machineries used in industries like Pharmaceutical, Food & Beverages and many more. It has well-planned and well-equipped infrastructure which helps them to manufacture high grade products. It provides a full range of labeling machineries which includes Bottle Sticker Labeling Machine, Front and Back Labeling Machine, Top Labeling Machine, Shrink Sleeve Applicators, Sealing machines and many more. It delivers creative and innovative designs at economical prices which has helped it to make its mark worldwide.